Sumatriptan is useful as form of treatment in acute states of migraine or in patient who suffers from cluster headache. The common sumatriptan may include rizatriptan, naratriptan and zolmitriptan. 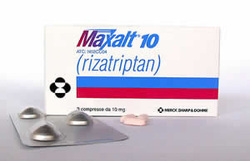 Sumatriptan may produce side effects such dizziness and chest pain due to coronary vasospasm. Sumatriptan may inhibit the inflammation and vasolidation of the dura by acting and stimulating the pre synaptic 5HT 1D. However this drug may also act and activate 5 HT 1B receptors which later lead to vasoconstriction of the intracranial vessel. Sumatriptan should be avoided/ contraindicated in patient who suffer from coronary artery disease due to sumatriptan causing coronary spasm.